The Saf range of pyramid style ring rolling machines where all three shafts are gear driven and manufactured from hardened and grounded strength steel. These machines are very flexible and are suitable for bending a variety of sections including tube, angles, flats, I beams and special profiles. There are two models available with the DS 60 Basic & the DS 60 Plus control systems. Digital display for the top roll read out position. Hydraulic movement of top roll position. Mechanical stop for the top roll to give greater bending accuracy. Remote foot pedal and emergency stop and simplified buttons to control the top roll. Machine can be operated Vertically and Horizontally. A choice of control HV, HP or CN. The HV version has an hydraulically controlled top roll. 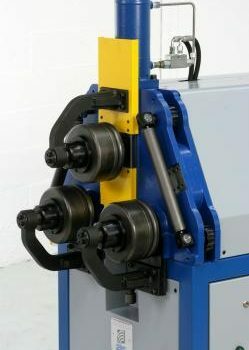 The operator uses the buttons to raise or lower the roll, there is a digital readout to show the position of the top roll also a mechanical stop to lock the position for further bending of the same radius. The HP version has an intelligent quote positioner that allows the setting of different positioningvalues and inserting directly the bending radius. 20 storable quotas on a single program. 10 additional programs of 10 quotas each. 10 bending radii predetermination programs in single snd multipass. Quota entering by means of of a keypad or self learning procedure. The CN version can execute automatically and in one pass up to 30 program steps, this means that it is possible to obtain 30 bends of different radius in the same bar. Storage of up to 20 programs. 2 speeds of axis adjustment. It is possible to create round arches, depressed arches, three centred arches, ovals and other shapes. It is also possible to operate manually.